This topic describes how to create a custom workflow activity and register it for use in Dynamics 365 for Customer Engagement Customer Engagement. For Dynamics 365 for Customer Engagement, custom workflow activities can only be registered to execute in the sandbox (partial trust). To develop Windows Workflow Foundation 4 custom activities for Dynamics 365 for Customer Engagement, you must develop them on Microsoft .NET Framework 4.6.2. The assembilies are available as Nuget packages and you can download from the NuGet profile crmsdk. To create a custom workflow activity, create a class that inherits from the CodeActivity workflow base class. This class is available in the System.Activities namespace. Activities that inherit from the CodeActivity class can override the Execute method to produce custom functionality. In the New Project dialog box, select Workflow under Visual C# in the Installed Templates pane, and then select Activity Library. Specify a name and location for the solution, and then click OK.
Navigate to the Project menu and select Properties. On the Application tab, specify .NET Framework 4.6.2 as the target framework. Add references to the Microsoft.Xrm.Sdk.dll and Microsoft.Xrm.Workflow.dll assemblies. Delete the Activity1.xaml file in the project. Add a class file (.cs) to the project. In Solution Explorer, right-click the project, select Add, and then click Class. In the Add New Item dialog box, type a name for the class, and then click Add. For more information, see Adding Metadata to the Custom Workflow Activity. Specify input and output parameters. For more information, see Adding Metadata to the Custom Workflow Activity. In the project properties, under the Signing tab, select Sign the assembly and provide a key file name. Custom workflow activity (and plug-in) assemblies must be signed. Compile the project to create an assembly (.dll). To view a code sample that demonstrates how to create a custom workflow activity, see Sample: Create a Custom Workflow Activity. For improved performance, Dynamics 365 for Customer Engagement caches custom workflow activity instances. The custom workflow activity’s Execute method should be written to be stateless because the constructor is not called for every invocation of the custom workflow activity. Also, multiple system threads could execute the custom workflow activity at the same time. All per invocation state information is stored in the context, so it is not recommended to use global variables or member variables to pass data from one invocation to the next. 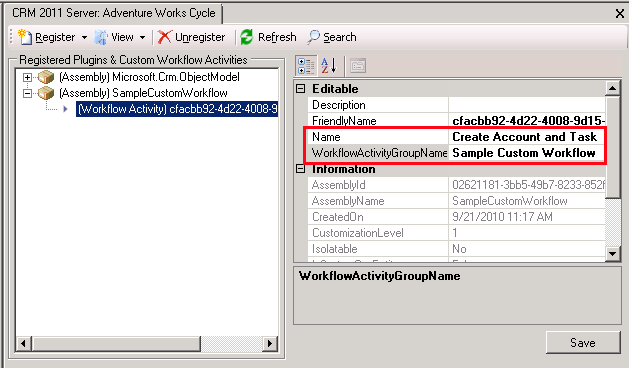 When you register a custom workflow activity assembly, specify the name and group name. The name property specifies the name of the workflow activity. The group name property specifies the name of the submenu added to the main menu in the Dynamics 365 for Customer Engagement process designer. These properties link the custom workflow activity with the Dynamics 365 for Customer Engagement process designer, so that the custom activity name will appear in the user interface. To specify the name and group name for a custom workflow activity, use the PluginType.Name and PluginType.WorkflowActivityGroupName attributes when you register the custom workflow activity assembly. For more information about registering custom workflow activities, see Registering the Workflow Assembly. If the PluginType.Name and PluginType.WorkflowActivityGroupName attributes are set to null, the custom activity is hidden from the Dynamics 365 for Customer Engagement workflow designer and is only accessible from XAML workflows. If you are using the Plug-in Registration tool to register the custom workflow activity assembly, you can specify appropriate values in the Name and WorkflowActivityGroupName boxes, under the Editable region. For more information about using the Plug-in Registration tool, see Register a plug-in. After this custom workflow activity is registered, you can use it from the Dynamics 365 for Customer Engagement process designer for workflows or dialogs. For more information, see Register and Use a Custom Workflow Activity Assembly.